It can be difficult to create a weekly schedule for your employees – but thankfully, you’ve stumbled upon the right place! Doodle is up there with the best employee scheduling software available, allowing you to make a poll quick and easy. You can be confident that your staff scheduling will be done on time and in a secure manner. Oh, Janice. You can put away the spoon and stop stress-eating cookie dough ice cream because your staff schedule is a stressful, complicated mess. No more double-booked meetings and no more double-fudge sundaes for you! 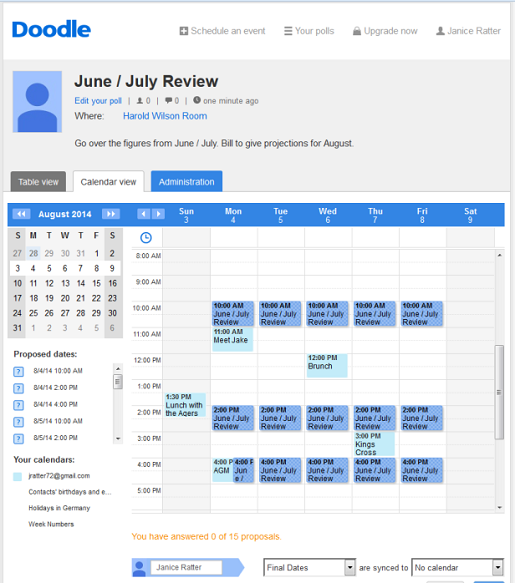 Doodle.com offers you a fantastic solution with the easy-to-use staff scheduler. Here’s how to get started. Janice visited Doodle’s homepage and began by clicking on ‘Schedule an event’. She didn’t need to view an example because she’s a doer, not a viewer, and so jumped right in to the staff scheduler. She enters the title of the event, ‘June / July Review’, and other pertinent data such as location and details. Janice has a premium account which makes the process a little quicker and offers extra features. It is possible however to use Doodle with a free account, and even without any account at all. In the latter instance you simply need to enter in your email address when you begin. Administrative links to the poll and notifications regarding your participants’ entries will be sent to this address. At any point throughout the process you can edit or delete the staff schedule. In step two, which you can see in the screenshot below, she selected the suggested dates by simply clicking on them. The meeting time length can be made shorter or longer by clicking on the bottom of the meeting box and dragging it up or down. The calendar view pictured is only available with a premium membership upgrade which is available at a minimal annual cost. Janice can also see which dates conflict with her previous appointments by syncing up her online calendars with Doodle, which is available with a premium membership. She can highlight which dates she can attend and which she’s unable to attend. This can be done automatically or manually. The dates she cannot attend are highlighted in red and the dates she can attend are highlighted in green. In step three of Doodle’s scheduling process Janice can simply click on the tab ‘Basic poll’ and be finished, ready to send the invitation link via Doodle’s built-in message sender or via her own private email. If she’d rather make the staff scheduler more specific, for example limiting the number of participants for each date, she can do that. She can also create an ‘If-need-be’ poll, whereby participants can select ‘If-need-be’ as well as ‘yes’ or ‘no. Once the poll is sent out, Janice need only wait for her colleagues to respond with their available time slots.